Learn how to make your own homemade cake mix from scratch. It is the backbone to many flavored cakes. Use this base cake mix recipe to make a yellow cake, chocolate cake, pineapple upside down cake, white cake and spice cake. It's a wonderful thing to have on hand. I recommend using cake flour as it makes this cake more fluffy and tender. If you're going to use all-purpose, sift it, then measure it out. In a large bowl, combine oil, milk and vanilla. In a medium bowl, combine flour, sugar, baking powder and salt. In a small bowl, beat egg whites until stiff peaks are formed (room temperature is best). Gradually add flour mixture to wet ingredients until just blended. Fold in egg whites and pour the batter into the dish immediately. Pour batter into greased and floured 9x13 inch pan. Bake for 25 to 30 minutes, or until a toothpick inserted in the center of the cake comes out clean. Homemade White Cake: Prepare as for the basic cake except use 3 egg whites for the 2 whole eggs. Whites may be beaten separately and added for a lighter cake. 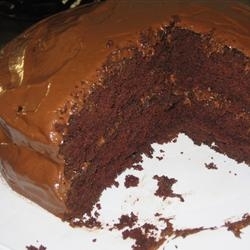 Homemade Chocolate Cake: Add 1/4 cup cocoa powder to the basic cake mix prior to adding the milk. Homemade Spice Cake: Add 1 teaspoon cinnamon, 1/4 teaspoon ground cloves, and 1/4 teaspoon ground allspice to the basic cake mix. Homemade Pineapple Upside Down Cake: Melt 1/2 cup butter in the bottom of a 9x13 pan. Add 2/3 cup brown sugar, stirring into the butter. Arrange pineapple slices in the pan. Top with the basic (yellow cake) mix recipe. Bake 30 to 35 minutes, cool 5 minutes, and invert to serve.